Emily started as the Threatened, Endangered and Diversity Program Coordinator in June 2017. 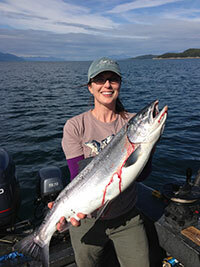 She is based out the ADF&G Headquarters office in Juneau. Emily earned her M.S. from the Montana State University studying the geographic distribution and spread of invasive species on mule deer, elk and big horn sheep winter range in the Gardiner Basin, Montana. Most recently, Emily worked for Montana Fish, Wildlife and Parks as the state-wide Arctic Grayling Recovery Biologist and Coordinator for the Big Hole Arctic Grayling Candidate Conservation Agreement with Assurances Program. She has also worked extensively in southwest Montana for over 20 years on large-scale habitat restoration projects, and various research and conservation projects involving pygmy rabbits, Greater sage grouse, mule deer, beaver, elk, moose, big horn sheep and willows. As the TED program coordinator she works with the Division of Wildlife and TED program staff, as well as other state, federal, NGO and private partners to conserve species of greatest conservation need across Alaska. She works closely with these partners to implement the State Wildlife Action Plan which provides guidance to keep "common species common". She has oversight and coordination responsibilities on behalf of the State of Alaska under the Endangered Species Act and primary oversight over the DWC portion of the State Wildlife Grants Program. When not at work, Emily enjoys hunting, fishing, mountain biking, backpacking, and traveling... most often in the company of her best friend (and dog), "Henry". Emily can be reached at emma.cayer@alaska.gov or (907) 465-6323. Chris Barger is a Wildlife Biologist for central, western, and northern Alaska (ADF&G Regions III & V) and works directly with the Regional Wildlife Biologists (Travis Booms and Julie Hagelin). 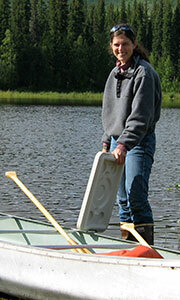 He is primarily based in the Fairbanks ADF&G Regional Office with frequent travel for research projects. He is currently a participant in Boreal Partners in Flight, the Alaska Shorebird Group, and serves as secretary as a steering committee member of the Alaska Raptor Group. Chris earned his M.S. in Wildlife Biology from the University of Alaska Fairbanks, where he investigated resource partitioning between two seabird species (Common Murres and Thick-billed Murres) using multiple techniques (stable isotopes, hormone analysis and Bayesian modeling). Additionally, he investigated the genetic diversity in Common Murres breeding on St. Paul, St. George and Bogoslof Islands which have contrasting numerical trends. Chris has a diverse background in avian biology and earned his B.S. from the University of Alaska Fairbanks. During that time period, he investigated several aspects in avian population genetics, hormone analysis, telomere analysis and led field expeditions in remote parts of Peru and Alaska (Pribilof Islands, Aleutian Islands, Middleton Island and western Alaska). He has worked with a wide variety of species including: northern fur seals, a variety of waterfowl, hummingbirds, seabirds (puffins, auklets, murres, kittiwakes) and passerines. 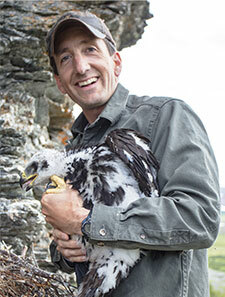 Currently, his focus includes raptor research with Travis Booms and Olive-sided Flycatchers with Julie Hagelin. In his free time, Chris is an avid outdoorsman and takes every possible opportunity experience new hunting and fishing adventures. He enjoys the diverse recreational opportunities provided by living in Fairbanks including: camping, skiing, snowmachining, canoeing, boating and backpacking with his yellow lab Pato. To submit metadata for the Alaska Raptor Metadata Database, please email Chris Barger (chris.barger@alaska.gov) to obtain a user login and password. Then return to this site and complete the form. Chris can be reached at chris.barger@alaska.gov or (907) 459-7250. Karen joined the Threatened, Endangered, and Diversity Species Program in February, 2009. She is based in the Douglas ADF&G Regional Office and serves as the Regional Wildlife Biologist for the TED program in Southeast Alaska. 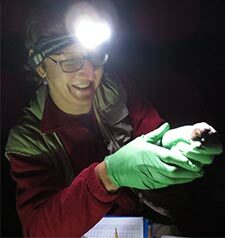 Currently her research is focused on the ecology and overwintering behavior of bats in Southeast Alaska. Other research efforts include baseline surveys of small mammals in alpine and subalpine habitats in Southeast Alaska and overseeing the development of an active Citizen Science program in the region. 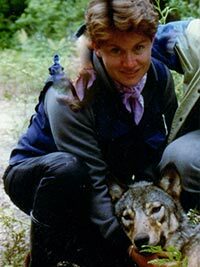 Karen earned her Ph.D from the University of California Berkeley studying coyote predation on domestic sheep in northern California. She has research experience with a diversity of habitats and species in both California and Alaska, including marine mammals, terrestrial carnivores, small mammals, ungulates, birds and amphibians. Prior to moving over to the Threatened, Endangered, and Diversity Program, she worked as a staff biologist at HQ and for the ADF&G Marine Mammal Program. Previously, she was a postdoctoral researcher at the University of Alaska Southeast, where she also taught a variety of undergraduate biology classes. When not at work, Karen enjoys playing hockey and soccer, as well as hiking and exploring the forests, mountains, muskegs, and shorelines of Southeast Alaska. Karen can be reached at karen.blejwas@alaska.gov or (907) 465-4328. Travis is a Regional Wildlife Biologist for central, western, and northern Alaska (ADF&G Regions III & V) where his primary research focus is on raptors and shorebirds. He is based in the Fairbanks ADF&G Regional Office, but frequently travels throughout both regions to accomplish the mission of the Threatened, Endangered, and Diversity Program. He is currently an active participant in Boreal Partners in Flight and the Raptor Research Foundation, serves as a steering committee member of the Alaska Raptor Group, and is the Region III and V falconry representative for ADF&G. Travis holds a B.S. in Biology and Wildlife Management from the University of Wisconsin Stevens Point, a M.S. 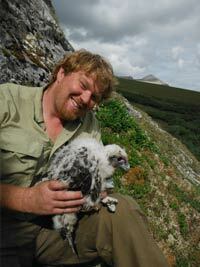 degree in Raptor Biology from Boise State University, and a PhD from the University of Alaska Fairbanks where he researched the breeding biology of Gyrfalcons in Alaska. His primary research interest and expertise is Arctic and sub-Arctic avian ecology. Travis brings a broad and valuable perspective on northern latitudes research and conservation from his years of conducting biological and physical science research in western and central Greenland. He began doing research in Alaska in 2002 and thus far, has focused most of his efforts on raptors, shorebirds, and passerines. Travis also brings extensive experience building and maintaining collaborative relationships among federal, state, native, and non-governmental organizations to facilitate effective research and conservation projects. When not working, Travis enjoys living near Fairbanks and the multitude of recreational opportunities interior Alaska affords, including skiing, river floats, backpacking, hunting, fishing, and falconry. Travis can be reached at travis.booms@alaska.gov or (907) 459-7335. Katherine (Katie) is the regional biologist for southcentral and southwestern Alaska (Regions II and IV), where she focuses on avian and small mammal research. 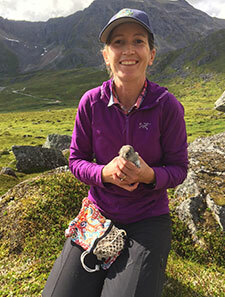 Katie earned her Ph.D. from the University of Alaska Fairbanks on ptarmigan ecology in the Arctic, and her master's degree from the University of Victoria on the links between salmon and songbirds in coastal temperate rainforests. Other research projects she has worked on include investigating the effects of climate and development on pronghorn populations, assessing songbird habitat requirements in boreal forests, and quantifying the relationship between Spectacled Eider survival and ice conditions on the Bering Sea. In addition, Katie has conducted human dimensions research in northern Alaska, focusing on the resilience of subsistence systems under changing Arctic conditions. Katie enjoys building collaborative relationships with other agencies, academic institutions, and non-profits to solve critical problems related to wildlife conservation. More information on Katie's research can be found here. Katie can be reached at katie.christie@alaska.gov or (907) 267-2332. 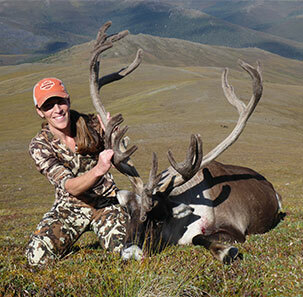 Julie Hagelin is a Regional Wildlife Biologist for central, northern and western Alaska (ADF&G Regions III and V), based in the Fairbanks ADF&G Regional Office. Julie's primary focus is on landbirds and small mammals. Her recent research efforts are focused on reducing the steep decline of the Olive-sided Flycatcher, a species that is an internationally-recognized conservation concern. 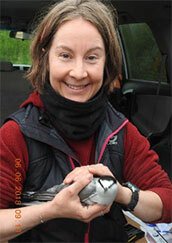 Julie is former co-chair of Boreal Partners in Flight, and acts as a Bird Conservation Region coordinator. Julie holds a B.S. in Biology from Pomona College, and earned her Ph.D. from University of New Mexico, where she investigated the breeding ecology of Gambel's and Scaled Quail. Julie's post-doctoral studies on seabirds in the Aleutians and on St. Lawrence Island brought her research focus to Alaska. Julie brings a unique background of biological research and conservation experience to the Threatened, Endangered, and Diversity Program. As an affiliate member of the Institute of Arctic Biology at the University of Alaska Fairbanks, and as former faculty at Swarthmore College, Julie is experienced at building collaborative, multi-disciplinary partnerships and spearheading conservation research teams. Her previous work has also included critically-endangered species in New Zealand and Madagascar. In her free time, Julie enjoys camping, fishing, skiing, and the multitude of opportunities to explore Alaska's wild places. Julie can be reached at julie.hagelin@alaska.gov or (907) 459-7239. Moira Ingle is a Wildlife Biologist and the Endangered Species Act Coordinator for the Threatened, Endangered, and Diversity Program. She is based in Anchorage, but is responsible for ESA issues state-wide. She analyzes and drafts comments on scientific and policy issues for federal ESA petitions, proposed listings and delistings, critical habitat designations, recovery plans, and regulatory changes. Moira holds a B.S. in Wildlife Science from Rutgers University and an M.S. in Wildlife Biology from the University of Vermont, where her thesis research focused on temporal and spatial interactions of red foxes, gray foxes, and Eastern coyotes. 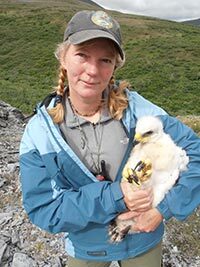 Moira also has research, survey, and management experience in the northeast U.S. and Alaska, working with white-tailed and Sitka blacked tailed deer, Alexander Archipelago wolves, Northern goshawks, Prince of Wales spruce grouse, small mammals, and neotropical migrant birds. She has substantial regulatory experience from her 7 years as an ADF&G Habitat Biologist in Southeast Alaska, where she worked extensively on logging issues on state, federal, and Alaska Native Corporation lands. Moira also earned a J.D. degree at the University of Idaho College of Law in 2010, with emphases on Natural Resources and Environmental Law and Native American Law, adding to her regulatory and policy perspectives. When not working, Moira enjoys hiking, skiing, skating, and other outdoor activities with her son and her six dogs. Kelly started her position as the Wildlife Biologist focusing on endangered species in February 2013. She is based in the Juneau ADF&G Headquarters office but travels throughout the state working with government and private partners to fulfill the objectives of the Department and Threatened, Endangered, and Diversity Program. Kelly earned her M.S. from the University of Northern Colorado studying the long-term effects of prescribed fire and ungulate herbivory on mule deer overwintering habitat in Rocky Mountain National Park, Colorado. Since graduating, Kelly's research has continued to focus the interaction between wildlife and their habitats including the ecology of songbirds, amphibians, and cave invertebrates, as well as plant community demography studies. In Alaska, Kelly's field research is mainly focused on seabirds and shorebirds, and she continues to work on habitat assessments for a variety of species. She also assists the Department's Marine Mammal Program, Waterfowl Program, and Regional staff with administrative activities related to federally listed and candidate species under the Endangered Species Act, including administration of the Section 6 grant process. Kelly can be reached at kelly.nesvacil@alaska.gov or (907) 465-6197. Tory has worked as a Wildlife Biologist since March 2017. She works in conjunction with the southeast Alaska Regional Wildlife Biologist (Karen Blejwas) and the statewide Endangered Species Biologist (Kelly Nesvacil). She is based out of the Region I ADF&G office in Douglas, but travels throughout the state to accomplish the mission of the Threatened, Endangered and Diversity Program. Tory holds a B.S. in Natural Sciences from the University of Alaska Anchorage. She is currently the coordinator of the Southeast Alaska Citizen Science Acoustic Bat Monitoring Program, a project focused on researching and monitoring bat populations across the region. Prior to accepting her current position, Tory worked for the ADF&G as a technician for numerous fisheries research projects across the state. Outside of work, Tory can be found tromping around the woods with an assortment of mutts, snorkeling the nearshore waters around Juneau, foraging for wild edibles, and skiing across the muskeg. Tory can be reached at tory.rhoads@alaska.gov or (907) 465-8155. Marian Snively works with the Region II & IV Wildlife Biologist III, to implement a number of research projects throughout Alaska. She is also the regions II and IV falconry representative. Marian earned her M.S. in Forest Resources and Environmental Science from Michigan Technological University in 2004, where she investigated heavy metal burdens in the tissues of ruffed grouse. She has a diverse range of biological experience that includes work with wolves, bears, walruses, seabirds, small mammals, and invertebrates, and has done field work in many locations around Alaska. Marian has previously served the DWC in Region II on several occasions as both technician and biologist. Marian can be reached at marian.snively@alaska.gov or (907) 887-2893.